NEW! 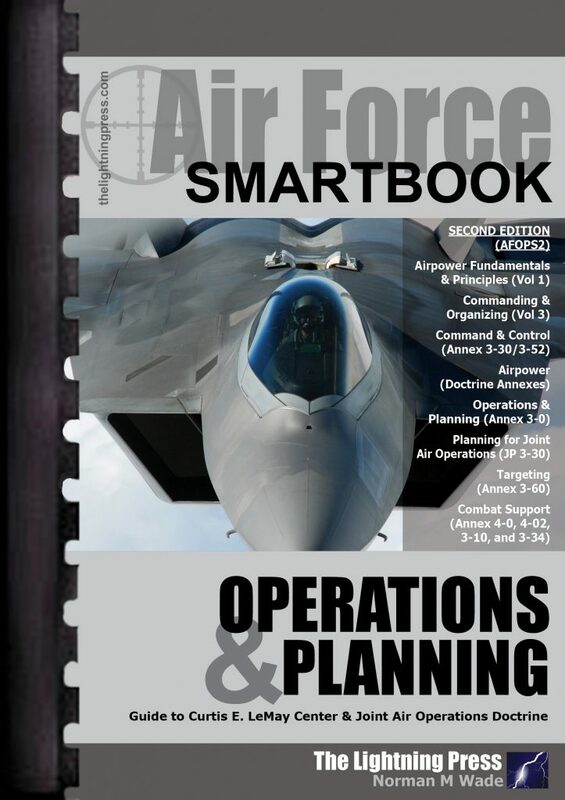 AFOPS2: The Air Force Operations & Planning SMARTbook, 2nd Ed. 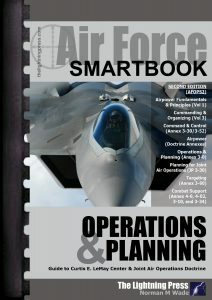 AFOPS2: The Air Force Operations & Planning SMARTbook, 2nd Ed. (Guide to Curtis E. LeMay Center & Joint Air Operations Doctrine) is the second edition of our Air Force SMARTbook. Topics and references of the 376-page AFOPS2 include airpower fundamentals and principles (Volume 1), command and organizing (Volume 3); command and control (Annex 3-30/3-52), airpower (doctrine annexes), operations and planning (Annex 3-0), planning for joint air operations (JP 3-30/3-60), targeting (Annex 3-60), and combat support (Annex 4-0, 4-02, 3-10, and 3-34). As the nation’s most comprehensive provider of military airpower, the Air Force conducts continuous and concurrent air, space, and cyberspace operations. Airpower exploits the third dimension of the operational environment; the electromagnetic spectrum; and time to leverage speed, range, flexibility, precision, tempo, and lethality to create effects from and within the air, space, and cyberspace domains. From this multi-dimensional perspective, Airmen can apply military power against an enemy’s entire array of diplomatic, informational, military, and economic instruments of power, at long ranges and on short notice. The Air Force conducts operations along a varying scale of military involvement and violence, referred to as the range of military operations (ROMO). They range from continuous and recurring operations such as military engagement, security cooperation, and deterrence; through smaller-scale contingencies and crisis response operations, as well as irregular warfare; to major operations and campaigns such as declared wars. The Air Force designs, plans, conducts, and assesses operations according to an effects-based approach (EBAO). There are some significant differences between the focus of strategy during steady-state conditions and the focus during contingencies and major operations. Contingency planning and steady-state planning employ a common logical approach and process referred to as the common framework for operations, which helps to foster coherence in Air Force strategy creation. Targeting is the process of selecting and prioritizing targets and matching the appropriate response to them, considering operational requirements and capabilities. The targeting cycle supports the joint force commander’s (JFC) joint operation planning and execution with a comprehensive, iterative and logical methodology for employing ways and means to create desired effects that support achievement of objectives.